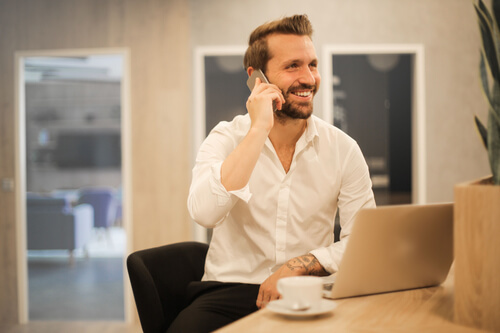 With dozens of VoIP providers out there on the market, it can be tough to figure out which one is the best choice for your business. As with any product or service, it’s always worth researching and comparing the top providers on things like pricing, features, setup, and customer support. Once you’ve narrowed your search down to 2-3 VoIP providers, we recommend calling each of those providers and grilling them on the details. We compiled the following list of questions to help small and medium-sized businesses (SMBs) find the best VoIP provider for their needs. 1) How Much Does it All Cost? For most businesses, price is a top factor to consider when deciding on any service or product–whether it’s a VoIP system, office space, or office furniture. But when it comes to VoIP providers, it’s important to be familiar with the company’s pricing structures before speaking to its salespeople. Most of the top VoIP providers—such as Vonage, RingCentral, 8x8 and Jive—offer separate packages for small business, medium-sized businesses, and large enterprises. Most of them start at around $20 per user and work their way up to more than $50 per user for a full suite of functions. Some companies offer all features for one price, while others offer basic functionality for a base price and additional features for extra charges. As an example, RingCentral offers a 4-tiered pricing system: an essentials package for up to 10 users for $19.99 monthly per user, a standard package for an unlimited number of users for $24.99 monthly per user, a premium package at $34.99 per user, and an ultimate package for $49.99 per user. 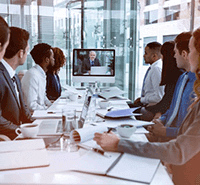 RingCentral’s premium and ultimate packages allow 100 and 200 people per meeting, respectively, while the 2 cheaper packages only allow 4 people per meeting. Before calling your shortlist of providers, make a note of which services you’ll need and which you won’t—and use these to negotiate a better starting price per user. 2) What Support Do You Provide to Help Customers Set up VoIP? As a paying customer, you should expect your VoIP provider to offer full support, including setup, onboarding, and training. As an example of what to expect from the top providers, Vonage offers new customers the services of a dedicated VoIP specialist. Once you activate your account, the specialist recommends IP desk phones and orders them to your offices. At the same time, a specialist porting team works on transferring your existing phone numbers to your Vonage business account. You’ll also receive a welcome kit, including a guide to setting up, onboarding, and custom features and tools. New customers may also attend a live “Admin Portal” training session for a broader view of the VoIP phone system. During your conversations with sales people, ask for a full breakdown of how setup and installation works—with a live one-on-one demo, if possible. When it comes to setting up infrastructure such as a VoIP, every company’s needs are different. Some companies have in-house tech teams that can handle complex setups, while others need as much assistance as their provider is willing to offer. Before reaching out to your potential VoIP providers, make sure you know what your needs are and how much help you’ll require with setup. 3) What Type of Customer Support do You Offer? Customer support doesn’t stop with setup and onboarding. If you’re running a growing operation, you’re going to need customer support sooner or later for any number of different issues. The more established VoIP providers offer extensive knowledge bases on their websites, with answers to dozens of frequently asked questions on everything from phones and headsets to voice analytics and integration and billing and accountant management. Depending on your pricing package, you should also expect access to a dedicated account representative who can help you through any urgent issues. When deciding on a VoIP provider, consider asking whether they offer 24/7 customer support (a must if your business operates around the clock); how they can be contacted (e.g. email, live chat, phone); and their expected response times. And don’t forget to read customer reviews, as they can be very revealing when it comes to a company’s level of customer service. 4) Do You Offer Mobile VoIP? One of the benefits of a cloud-based VoIP system is that it allows you to communicate from anywhere. Therefore, any VoIP provider worth their salt should offer a mobile VoIP solution to enable employees to participate in meetings remotely. Many top providers offer virtual office apps for iOS and Android. For example, if your company uses 8x8’s VoIP service, your employees can download its virtual app to benefit from many of the same features as they would if they were working from their office phone. Employees can use mobile VoIP to save money on calls and global roaming, make calls from the company directory, listen to voicemail, record calls, and participate in company conference calls from anywhere in the world. These days, almost every SMB has the need for mobile communications. Ask your provider about mobile VoIP to integrate your office and remote operations. 5) What Features Does Your Voicemail Have? Voicemail is a fixture of most VoIP services, but how good is it? Does your chosen provider offer only basic voicemail, or does it offer customizable features to ensure you never miss a customer—even when your offices are closed? For example, RingCentral enables companies to configure their voicemail system so that employees can check their own voicemails or the voicemails of colleagues (provided they have the necessary permissions). It features customizable voicemail greetings, plus an essential but often-overlooked feature: holiday hours. With holiday hours, you can create custom rules for special routing during holidays, closing times, or specific hours of the day—and handle those calls accordingly with features such as call-forwarding, screening, greeting, or hold music. Even when you’re away from the phone your business’s fortune is still on the line, literally. Don’t forget to ask your VoIP company about voicemail features. 6) Does Your VoIP System Integrate with Third-Party Apps? As cloud-based VoIP systems have become more and more sophisticated, providers have been developing integration abilities. Even small companies need email, analytics, and customer relationship management tools, and you should expect your VoIP provider to facilitate integration between your phones and these other types of software. As an example of what to expect, Vonage offers the following integrations: Salesforce, Salesforce Desk, Microsoft Dynamics, Office 365, G Suite, Oracle, Oracle NetSuite, Clio, Workplace by Facebook, Zoho CRM, JobDiva, Zendesk, Bullhorn, ConnectWise, SugarCRM, and ProdoScore. 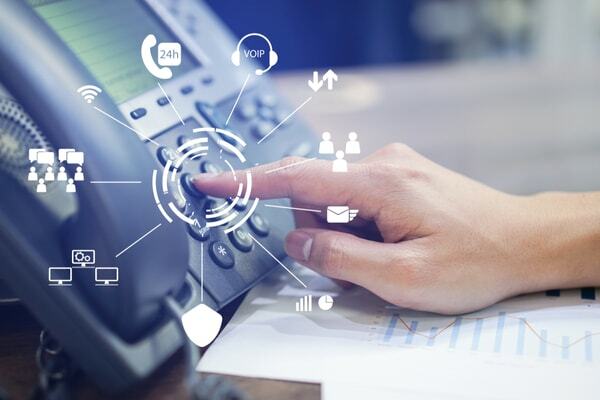 If you rely heavily on a particular type of software, shop around to see which VoIP providers can accommodate you, or ask them if they’re able to create a custom integration.